Say hello to my new favorite shirt! Also, say hello to my new favorite shirt!! This entry was posted in Blog, Personal, Pictures, Random, Research, Writing on September 26, 2015 by Erica Cameron. When writing a book set in a place you’ve never been, it’s a good idea to get pictures and information from the locals. When writing seven you better get your behind on a plane. Luckily for me, my co-author Lani not only lives near the area we’re writing in, she has birthdays. Every year in fact! Almost like clockwork or something. It’s weird. This year we combined a research trip and a birthday trip and got an epic weekend of awesome things! And I have pictures to prove it! The weekend involved sightseeing, author pictures, visiting beaches and restaurants we want to use in the books, bonfires, and book events. And a whole hell of a lot of cupcakes. And really beautiful, cool weather, which was an added bonus. We plotted out an entire book we had nothing for before and spent time together in person instead of on Skype–another bonus! Below the link are some pictures from the trip that I loved. I can’t wait until we meet up again. Maybe next time it’ll be on my side of the country! This entry was posted in Blog, Inspiration, Lani Woodland, Pictures, Research, Travel, Writing on November 19, 2012 by Erica Cameron. Sometimes research is one of the best things about writing. In the name of research, I have crossed the country! Okay, also in the name of friendship and vacations and birthdays and cupcakes and just because, but research shall also happen! Lani Woodland and I are working on multiple projects together and, somehow, they’ve all end up set in and around Los Angeles and Laguna. Now, this is okay for her because she lives within an hour of those locations but it’s not so easy for me to swing by and get a feel for the place considering I live about as far south in Florida as you can get before you hit the Keys. So what happens when you combine a birthday present with the need to research a place for a book? Apparently, you get a cross-country weekend trip! Or, I do anyway. I flew out of Florida last night and today we head for Laguna! We’ll be scoping locations and scenery and lifestyle. We’ll be trying out the restaurants and talking to the people. All in the name of authenticity, you know. But also in the name of how-much-awesome-can-we-shove-into-one-weekend? Look for pictures and updates next week! Hope you guys have an awesome weekend, too! This entry was posted in Blog, Lani Woodland, Personal, Research, Setting, Travel, Writing on November 9, 2012 by Erica Cameron. Sometimes we have questions, but the answers don’t come easily. Or maybe they just bring up more questions. Maybe you’re working on a project and it would be so cool if your character could do such-and-such or if they knew everything about whatever. Researching the topic yourself is the best way to get answers, but that research isn’t always easy. One of my novels on a back burner right now involves a girl who is very math-minded. The problem? I am so not a math person. At all. Never have been. In fact, it took me three years just to master multiplication. I wish I was exaggerating. I haven’t worked on this story much yet (partially because the idea of going back and assigning myself math homework was a little scary), but I overheard someone at work talking about an online library of videos, something called The Khan Academy. There are some ideas and that are so genius you wonder how no one ever done something like this before. Salman Khan began by tutoring his cousins online and eventually posted some of his lessons on YouTube. Other people found them, commented, and soon he was posting more and more lessons, getting hundreds, then thousands of comments from all over the globe. Soon he’d created a library of simple lessons on math and science from basic addition to higher maths like calculus and physics. These videos have been used as tutoring tools, homeschooling lessons, and even in classrooms. Suddenly, because of these lessons, going back and relearning math doesn’t seem so scary. I’m telling this story for two reasons. 1) Don’t back away from a story idea just because one element of the story is daunting. You never know when the right tool is going to fall into your lap. And, 2) Salman Khan really is a genius. For a long time I’ve hoped to homeschool my kids (when/if I ever have any), but teaching math and science wasn’t something I looked forward to. I think that the lessons he’s creating here will change the face of education not only for parents who don’t trust the educational system, but also for the students who are enrolled in public (and even private) schools. The Khan Academy and Salman’s hopes for the future of education are best explained in his own words, so I’m going to leave you with this video of his appearance at the TED Talks (another really fascinating library of videos). Hopefully you’ll learn something new. If not, you might at least find it entertaining. This entry was posted in Blog, Education, Research, Technology on April 6, 2012 by Erica Cameron. 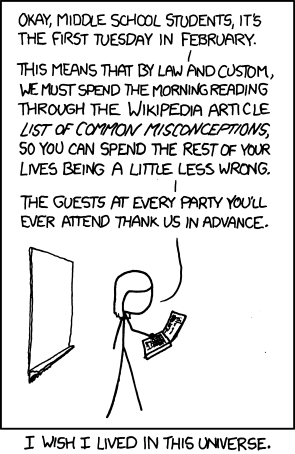 I found this XKCD comic online recently and then asked myself, does Wikipedia really have a list of common misconceptions? Another Google search showed me that, yes, they do! How intriguing. Some of the information on this rather long list I already knew, some of it I didn’t. What it made clear to me, however, is how easy it is to get something wrong. Misconceptions, misperceptions, and misunderstandings happen all the time. In fact, it’s a little scary how easy it is to misunderstand someone. Since misinformation is so prevalent, how do you know what to believe when doing research for your books? Especially when a lot of research is being done online and all it takes to make a source look legitimate is a good website and a believable url. It’s a tricky question and truly depends on the subject. A lot of times, though, finding someone who works in the field and asking them to direct you to reputable sources or answer some questions is the best and safest way to go. If this fails, books published by a reputable house are usually (but not always) safe. Textbooks are safer. You can use the internet as a starting point, but don’t let it be the only way you research. Below the cut line are some of the misconceptions I found interesting, amusing, or weird. Since they’re on Wikipedia, I in no way vouch for them being 100% true, but it’s still interesting. To see the full list, go here. This entry was posted in Blog, Funny, Research on December 29, 2011 by Erica Cameron. Research: Would People Think You Are Crazy? This entry was posted in Blog, Random, Research, Technology on October 8, 2011 by Erica Cameron.